This review originally appeared on Geek of All Trades, and is reproduced here with some minor editing. Mrityudand ("Death penalty") is an excellent film that straddles the art-house and mainstream filmi universes. On the mainstream hand, it stars Madhuri Dixit, who was the undisputed queen of Bollywood at the time of this film's release, and includes five catchy songs and some great dancing. On the other hand, its supporting cast includes Shabana Azmi, the undisputed queen of Hindi art cinema, and it tells a decidedly un-mainstream story. Perhaps the greatest achievement of Mrityudand is that its marriage of art and masala works so well. It was one of the first Hindi films I saw, when I didn't know much about the style and themes of Hindi film, and it remains a steadfast favorite even now, scores of films later. Mrityudand tells the story of a family beset by financial troubles brought on, in part, by the machinations of a corrupt politician and a vicious, thieving businessman. When the businessman - Tirpat, the film's unequivocal bad guy - schemes to murder the local pandit, the owner of a valuable quarry takes the pandit's place. This leaves the new Pandit's younger brother Vinay, a newly-married aspiring contractor, in charge of the property and ripe for manipulation. Tirpat's schemes bring ruin to Vinay and threaten his blissful marriage to Ketki, played with intensity by Madhuri (below, with Ayub Khan as Vinay). Meanwhile, Ketki's sisters-in-law face travails of their own. Kanti (Shilpa Shirdokar), is forced to give herself to Tirpat's men to repay her husband's own debts to him. And the eldest sister-in-law, Chandravati (Shabana), is devastated when her husband leaves her to become pandit. After a life-threatening illness, she finds comfort in the arms of a family friend and servant. Inspired by Ketki, the sisters-in-law and an army of other women terrorized by Tirpat and his cronies stand up and fight against the subjugation they have endured. The film ends with a melodramatic showdown, a literal battle of the sexes, which leaves no doubt that justice has been done, though with a price. The only criticism I have of the film is that the opening scenes move very fast, rapid dialogue and quick cuts introducing the characters and setting the stage for their unfolding relationships - it can be a little confusing early on, and I found it made more sense on repeat viewings. Even the first time through, though, I was able to quickly sort it out, and I was drawn into the story as Tirpat's schemes spiraled around Vinay to ensnare him. There was little subtlety in Mrityudand's drawing of lines between good and evil. Tirpat is a mustache-twirling, manipulative, nasty villain who mentally tortures his wife for fun; Ketki is strong, outspoken, and spirited, but an otherwise unassailable Indian wife and unquestionably the character to root for. None of this detracts from enjoyment of the film, and may even make Ketki's rifle-wielding triumph that much more satisfying. As the women around her draw strength from her presence, Ketki herself seems to grow in confidence and stature. Shabana's top billing was, ultimately, the reason I chose this film so early in my exploration of Hindi film, and I would have liked to have had more of her, but Mrityudand is really Madhuri's show. Shabana's Chandravati spends the first half of the film lying about and moaning at her husband's abandonment. It is not until illness takes her away from her home that she finds her voice and springs to life. In one of my favorite scenes in the film, as Rambaran (Om Puri) begins to seduce her, the hesitant Chandravati retreats from him - right into the bedroom. I've never seen a more delicious and subtle portrayal of a woman's ambivalence at her desire, and Shabana's wide eyes and expressive mouth just complete the scene to perfection. Chandravati's defiant return to her home is marked by a speech in which she announces to her husband that she has completed her penance for failing to give him children and wishes to live again, through desire. This moment is eerily reminiscent of the confrontation between Shabana's Radha and her husband at the climax of Fire. Shabana's performance in Fire was ultimately more satisfying - Radha was crafted with far more depth and subtlety than Chandravati, because Fire is entirely Radha's story while Chandravati is more of a sidebar in Mrityudand. But it is fascinating to me that Shabana played two such parallel roles in the same year, and I wish I could know more about how that came to be. Finally, Mrityudand features a lovely and understated soundtrack by Anand-Milind (lyrics by Javed Akhtar), including the delightfully sweet "Keh do ek bar sajna," in which a woman cajoles her husband into describing just what he loves about her. "The clouds are your kohl, the sky the fall of your sari," he answers, "the sunlight is your bindi." 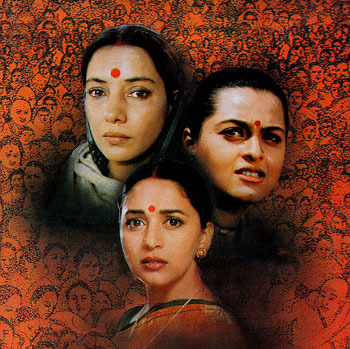 Below, the three sisters-in-law; Chandravati begs her husband not to abandon her.